Events shape society. But what exactly constitutes an event, and what factors shape it? Through her research, Robin Wagner-Pacifici strives to answer these questions. With a background in comparative literature, Wagner-Pacifici brought a humanistic approach to her graduate studies in sociology, studying the ethnography of speaking and sociolinguistics in order to “read” society by listening to the language surrounding events. First focusing on conflict and violent events, Wagner-Pacifici studied the ways language, images, and symbols shaped those events and mobilized people. Her work has examined different groups and political ideologies to determine whether similar patterns arise despite the differing ideologies and led her to write books on standoffs and military surrender. Wagner-Pacifici's latest book, What Is an Event? (University of Chicago Press), presents the idea that events never end, but rather keep changing form and may even undergo a period of hibernation until they are revived when a new group takes interest. In addition to writing this new book, Wagner-Pacifici has also begun computational analysis of texts, including the National Security Strategy Reports of the United States, to analyze relational networks within the documents. This work has sparked her interest in data visualization and in developing partnerships with New School colleagues at Parsons School of Design to help her and her students present their findings in new ways. Wagner-Pacifici attributes the ease with which she collaborates with other scholars to the interdisciplinary nature of NSSR's Sociology Department. 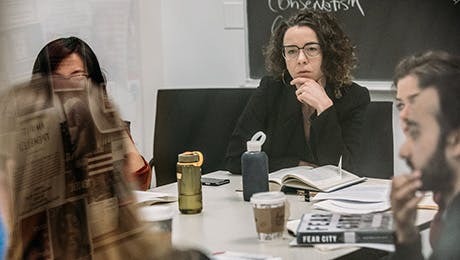 Trained in additional disciplines beyond sociology, including history and political theory, the faculty create an atmosphere of skepticism toward traditional academic boundaries. Wagner-Pacifici notes that while most American sociology departments are U.S.- centric, at NSSR the focus is much more international, because of the demographics of both the faculty and students. Unlike many sociology programs, NSSR also emphasizes qualitative approaches over quantitative ones.